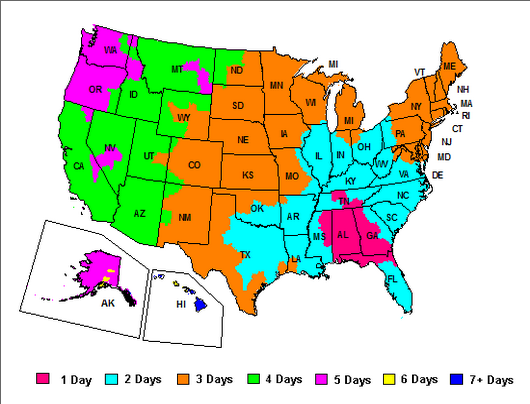 Shipping and processing times vary by certain products or listings. Some products we almost always have in stock and generally ship out the next business day, while others take up to 3 days to process the order. For shipping transient times. Please see the map below. In most case we can have your system to you within 5-7 business days. Can you tell me about your POS systems? Basically every system we offer is listed right on the website. Most right on the front page. Our systems will work in pretty much any type of bar or restaurant. If there is a system you are interested in but its missing a kitchen printer for example you can add those items to your cart before checkout. If you would like for us to put together a custom quote we can do this for you as well. Complete our contact us form or give us a call with your specific needs. I have small bar/ I run a small coffee shop. Will Redfish work for me? Yes. Both Redfish and Blackfish both have a table service mode and a Quick service mode that works for bars/coffee shops. Works good for any walk up counter service. If you download the demo by default it is in table service mode so if you would like to try it in quick service mode we can help you switch it over to quick service mode. If you want to give it a shot your self, look for a button called Switch to Quick Service on the Kiosk Configuration screen. I would like to purchase a system. Can you take my order over the phone. No. All orders are done right on our website. You just find the system you want, click the add to cart button, punch in your billing and shipping information and continue through check out, adding your payment information. All payments are made through Paypal Checkout. We accept all major Credit Cards through Paypal Checkout. When you reach the Paypal Checkout page you will see the option to pay by Credit Card towards the bottom of the page. How long will it take to get my system? For most orders, as long as we have everything in stock, we ship out next business day. When we receive an order our techs completely pre-stage the system here on site. They install all the software, drivers, pre-configure the connections and test all the hardware for proper operation before packing it all up and shipping it out to the customer. We ship everything via FEDEX and UPS. Who programs all my menu items? You do. The listings on our site do not include menu programing. Our systems are priced very competently and don’t allow us enough margin to include menu programing however we can offer menu programing at $1 per menu item/modifier. ($1 per menu and per modifier.) Please contact us with a copy of your menu if you are interested in this service. The system will come with everything you see listed in the listing. In most case it will come with everything you need except for your network. You will need to have a network and internet connection in your building. This will be very important for multi station systems. The system will come ready to be plugged into your network and ready for you to start adding your menu items, prices and tax rates. Some of the systems do have wireless. For the ones that don’t, it can be added to the order for about $20 per station. Look for the Add Wi-Fi option near the Add To Cart button. We highly recommend a wired connection though, as it is much more reliable. For single stations it won’t matter so much. Who will install the POS system? We are an online only company. When we receive an order our techs pre-stage the system here on site. They install all the software, drivers, pre-configure the connections and test all the hardware for proper operation before packing it all up and shipping it out to the customer. In most cases, if the customer can put together a home computer, they can setup a POS system. However if you have a friend or family member, or even an employee who has a little computer skills, this would ideal. If you require a point of sale system to be installed in your build you may need to contact a local POS dealer. They will generally do this kind of hands on installation and hands on training, although it will be at a significantly higher price. This will vary by what software you decide to go with. Our PointOS option is limited to Merchant Warehouse and Mercury Payments. Our Redfish or Blackfish software options do have the ability to use any processor but the cost to do so can be high for certain merchant providers. Please visit the http://www.redfishpos.com/merchant-processors/ for more information. Our Salon systems can use Merchant Warehouse, Mercury Payments, and Charge it Pro.